A 2 course dinner from the pre theatre menu at Spaghetti House Leicester Square with an Upper Circle ticket for Blood Brothers the musical play at the Phoenix Theatre. The Blood Brothers Theatre play is written by Willy Russell, one of the country’s leading contemporary dramatists, BLOOD BROTHERS tells the captivating and moving tale of twins who, separated at birth, grow up on opposite sides of the tracks, only to meet again with tragic consequences. The incredible score includes Bright New Day, Marilyn Monroe and the emotionally charged hit Tell Me It’s Not True. Hailed as one of the best musicals of all time – scooping up no less than four awards for best musical in London and seven Tony Award nominations on Broadway. 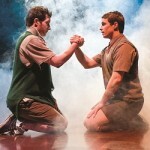 Experience this great British musical of the Blood Brothers at the Phoenix Theatre today! IMPORTANT INFO: The recommended age for children is age 12 and above. Children under the age of 4 will not be admitted to the theatre. A passion for good food and authentic Italian flavours were the main ingredients which inspired the Lavarini family to open the first Spaghetti House restaurant in 1955 in Goodge Street. Since those early days Spaghetti House has now grown into a 10 strong group of restaurants, all located at iconic locations in the West End of London, where generations of customers continue to enjoy the same convivial hospitality and friendly service combined with the delicious simplicity and affordable quality of Italian cuisine. Disclaimer: Please note that this is a sample menu only. Although we make our best to ensure that the information is up-to-date, we shall not be responsible for any changes made by the restaurant.